You must be super excited to have your final book in the Birth Right Trilogy, Feel the Burn finished and ready for readers to download! How long has it taken you to write the trilogy? Around three and a half years. It's rather scary to write that down! What are you going to do now that you have finished it? Do you think there will be a spinoff of other characters or do you have completely new stories in the works? The Arrival, your first ebook is available in book form, is that right? Where can your readers purchase this? Everywhere that ebooks are sold. Amazon/Smashwords/Sony/Kobo/iTunes/Barnes & Noble - the list is constantly updating! And of course the first book is available free almost everywhere. How do you come up with the names for people and the places? How do you not get them all mixed up? You must have an extensive file with all the names on! To create the names I often use friends/family names and just rearrange the letters. Leseach is an anagram of Chelsea and Nnelg is Glenn backwards. Other times I use a fantasy name generator to give me ideas. The name generator is great for ideas. I don’t have a particular file system for the names, though I probably should. For me, because I’m so involved in the story in my head the names just make sense. I remember them all the same way I remember clients/workmates names – all through recognition of the characters. Occasionally I do need to flick through my current draft to check the spelling of a name (or that I haven’t overused certain letters, making the names look/sound too similar) and the note pad beside me bears the new names of characters for a little while. But no permanent file. I think most of us know that you use method writing as you draft. In those scenes of intense emotion, how long does it take you come out of it after writing? Does it feel surreal when you're done for the day? Depending on what scenes I’m working on at the time, I can stay partially submerged in the other world for days, even weeks. Especially when I’m working through the really intense scenes. It does feel surreal coming out of it, actually it feels bloody exhausting at times! I’m very grateful that Glenn can deal with the random mood swings so well *lol*. I have noticed some similarities between characters with those in movies - have you drawn inspiration from movies such as Avatar and Lord of the Rings? Everything inspires me – documentaries especially – so it’s not surprising that you see some similarities as those writers/directors also drew inspiration from nature. Earth has so many weird and wonderful creatures to give me ideas and I love drawing on the old legends and tales for inspiration – after all, they were inspired by nature too! What has been the weirdest Earth creature that has inspired one in your story? What creature did you create from it? Which old legends have particularly inspired you? Maori, Fae? Which has been your favourite? The old Greek and Roman tales and the ancient Gaelic tales. I don’t have a particular favourite, I just love all the creatures they have in them! Was it easy to self publish? Yes and no. Technically anyone can do it and the process, while fiddly, isn't that hard. But so many other parts of it are intensely time/energy consuming. It can be a very rewarding hobby but also very frustrating. Where did you find the artists for the covers? What was the cost for this? Yes, more than expected. Considering there are over 1.5 million ebooks on Amazon alone, it's very exciting to be sitting in the top 10-15k. So while it isn't a full time income yet, it is a hobby that is starting to pay it's way. Although if you wanted to break it down into an hourly rate it would be very sad *lol* Writing for me, is very much a labour of love. And that labour of love is available now! 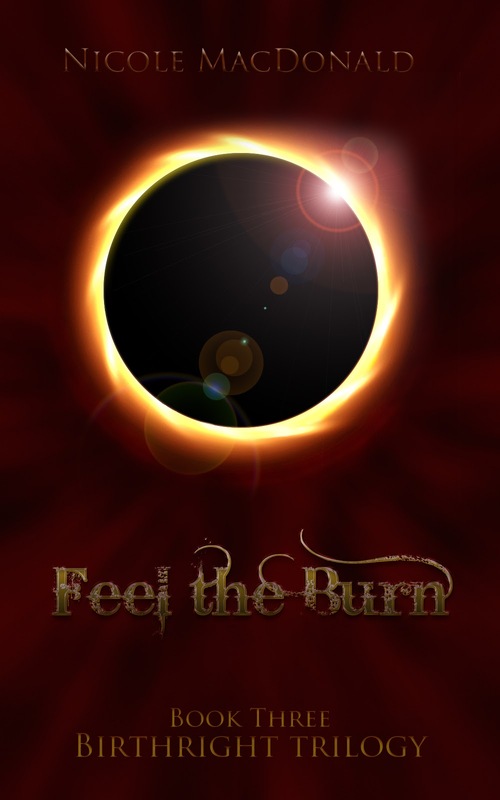 Buy Feel the Burn here from Amazon. Continuing from the second book of the BirthRight Trilogy, Awakening, is the final installment—Feel the Burn. The battle to save Gar’nyse is upon them and already the costs are insurmountable.